I’m not one of those people who redecorates according to the season. However, in the midst of Autumn, when the days get shorter and the air a little more crisp; it’s always nice to maximise the ‘cosy’ factor by incorporating a few well chosen accessories. 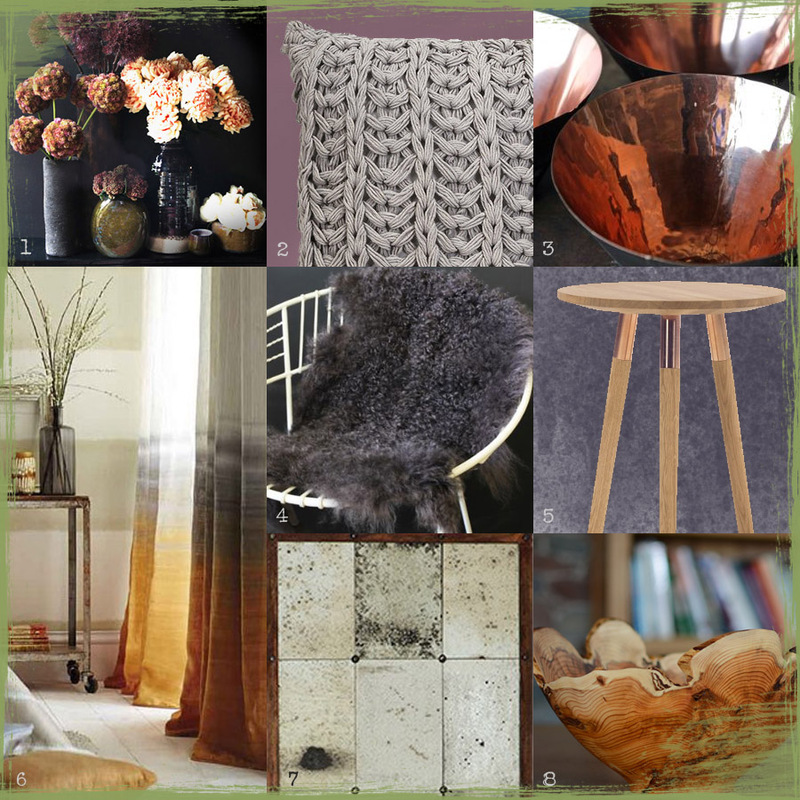 When I think of Autumn (in interior design terms), I think of wood, lots of texture, metals, dense florals and moody colour palettes. So instead of relying on the stereotypical red hues/berries/conkers/acorn associations, I’ve tried to source objects and furnishings that are less predictable and more visually intriguing. I’ve put together a little presentation board (below) to illustrate my juicy little finds for your viewing pleasure. Ok, we all know that I’m a huge fan of Abigail Ahern. I’ve mentioned her signature style many times on various blog posts and I have taken much inspiration from her unique design style (dark, she likes things dark). In this instance I’m recommending her faux flowers. They are quite (ok, extremely), expensive but there’s a simple explanation for that: they’re amazingly life-like. They are full, luscious blooms that come in a range of striking hues (that will never wilt or die…SCORE!). There’s no better way to celebrate the rustic Autumnal season, than to have rugged pots and ceramics overflowing with zesty florals. Texture plays a huge part in creating a space that is inviting and snug. And this knitted cushion that I spotted on Houzz provides both visual interest and a very welcoming tactile quality. Who needs a man to cuddle up to, when you’ve got one of these bad boys?! Ok, I’m overshooting slightly but you get my point. Rocket St. George sell these pretty cool little bowls/tealight holders. Their copper finish is synonymous with the burnt orange associations of Autumn and their metallic finish will catch the evening light to pefection. They are funky. End of. This throw is also from Rocket St. George too. It has ‘comfort’ written all over it, with its rich inky hue and soft Mongolian Lambskin texture. I love this side table from MADE.com – it has vintage styling with awesome copper detailing. This is my personal favourite. If you’re in the mood to splurge, this fabric from Harlequin should be at the top of your Autumn ‘To Do’ list. The combination of earthy grey and amber is obviously very Autumnal but the linen fabric ensures an airy and light aesthetic. It’s difficult to appreciate this antique mirror in my presentation board but its rustic quality was the main reason for its inclusion in my Autumnal theme. It’s from Occa-Home and adds a dollop of vintage charm and character. Wood, in all its natural glory is a definite winner when it comes to Autumnal styling and this hand turned bowl is definitely an eye-catcher. These are the creations of Jonathan Leech, check out his website here. 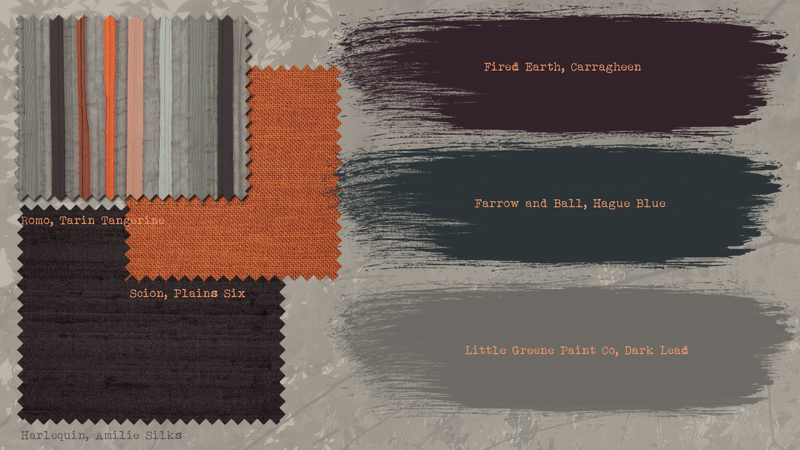 If you’re inspired by the various colour palettes used in the above board and would like to redesign your entire space, I have chosen a selection of fabrics and paint colours that encompass this rich, lush and earthy Autumnal inspired look. P.S If you’d like to see the above colour palette used in a photo-real image, then you’ll want to click here. Love 2, 4 and 6 and the colour palette, want to redo the whole house now! Know I’m a big fan of white; yes even in autumn/winter and colour is added through my personality :-). Nonetheless, i enjoyed your autuminal blog.